After months of testing, Google has finally (albeit quietly) started to roll out their new Google Play Store Listing design. 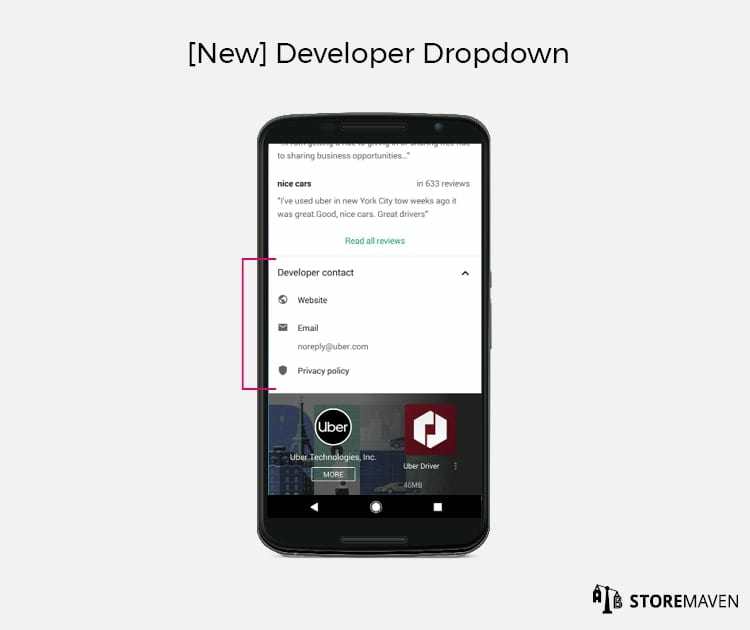 Google began testing a new Store Listing layout earlier this year, sparking much interest and speculation from the mobile app industry as to when (or if) it will be released to all devices. Even though they haven’t yet publicly or officially announced the new design (and there are still minor tweaks to the design being tested), there are fewer signs of the old layout, and the major design overhaul is now more widely available. As soon as Google began their test, we released a short update on what the new layout would mean for developers and App Store Optimization (ASO) in general, and we began running our own initial tests on the new design in order to analyze the impact these changes would have on our clients’ ASO efforts. Although Google is pushing a layout that is slightly different from the one they had most recently been testing, the changes are significant, similar to the iOS 11 revamp that occurred this time last year. 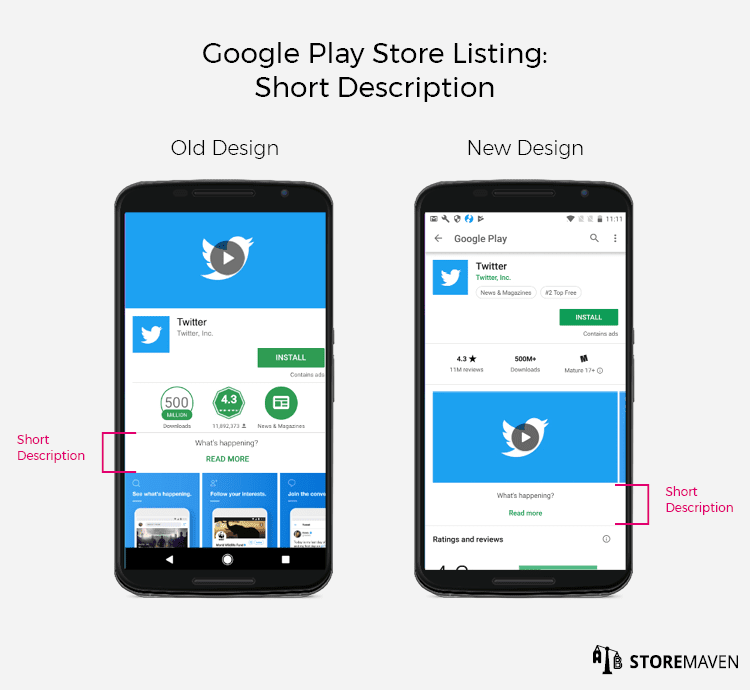 The new layout will have significant implications for any mobile app marketer, developer, and ASO manager who wants to optimize their Store Listing for Google Play, so it must be taken seriously. Before we get into the impact this new layout will have on your ASO strategy, let’s dive into the major changes you’ll begin to see. Feature Graphic is now gone. The Feature Graphic used to be the most prominent and impactful asset on your Store Listing. Now the Gallery takes its place as the most important element to optimize. Video has moved! Videos now appear within the Gallery as opposed to the Feature Graphic. This puts a new, more prominent, focus on Video. Our data show that a good Video can potentially lift CVR by up to 40%! Screenshots are a big deal. Screenshots used to be located below the fold but now take up most of the real estate in the First Impression Frame, which has the most impact on CVR! Make sure the first Screenshots carry your app or game’s most impactful and convincing messages. Don’t assume that whatever works on iOS will work on Google Play. The design of the stores are not the same, your users are not the same, and the traffic you send to the stores is not the same. They are entirely different platforms, and should be treated as such. Quickly assess the impact of the new layout! Given the significance of the new changes and the way Google shifted the location and prominence of your creatives, it’s highly likely that your Store Listing is not optimized for the new layout. This could mean your CVR will see an immediate hit unless you address this situation and begin testing as soon as possible. Decisive Visitors who decide to install or leave without ever engaging with the page. These visitors are only exposed to creatives that appear in the First Impression Frame (everything above the fold), and their first and only action is either tapping the install button or leaving the page altogether. Exploring Visitors who choose to browse through available content on an App Store page to make a more informed decision before installing. One of the most significant and noticeable changes to keep in mind is the removal of the Feature Graphic from the top of your Store Listing page, which subsequently brings the Gallery fully above the fold and into the First Impression Frame. If you have a Video, your Feature Graphic will now appear in the first slot of the Gallery, followed by your remaining Gallery Screenshots. However, it’s important to note that when the Feature Graphic is moved to the Gallery, the size of the Gallery is reduced by 23%. This is because the proportions of the Feature Graphic are different from what is allowed in the Gallery. This is an important change to be aware of because the Feature Graphic used to be the most important visual asset on the page and had the potential to boost conversion rate (CVR) by 24-31%. Now, it’s the Gallery that will have the most impact on your CVR and overall performance. The Icon and Title remain the same size, but the Developer is now given more attention as it’s listed in bold, green font under the Title. Additionally, there are now tabs underneath the Title that list an app or game’s Category, Unique Ranking (if applicable – for example, #1 Top Free, #2 Top Grossing, #3 Top Social, etcetera), and Editors’ Choice (if applicable) in circular ovals. These new labels have replaced the Age Rating that used to be listed under the Developer’s name. 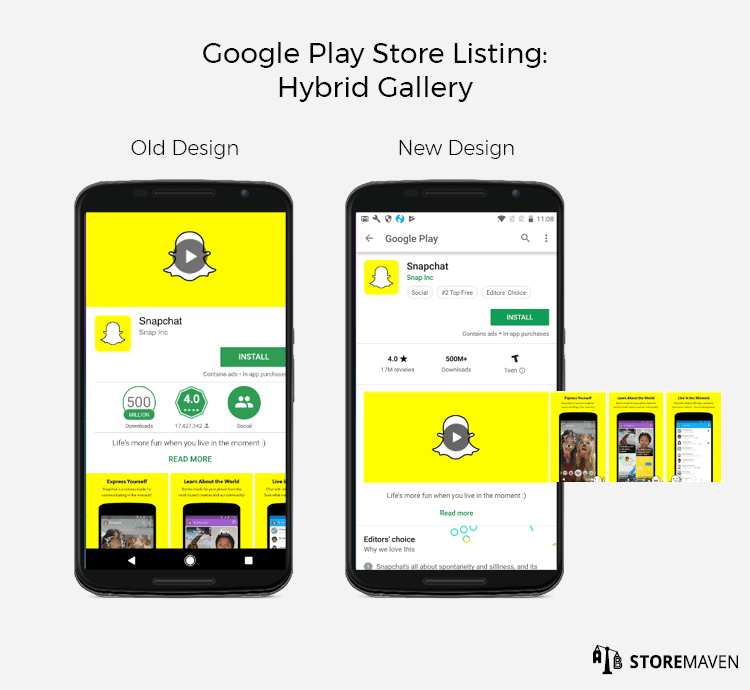 In previous iterations of the Google Play redesign, Google tested an Install button that expanded across the full width of the Store Listing, but the Install button has remained the same size and prominence as in the old layout. The Evaluation Panel has gotten a design facelift. The large, green illustrated badges have been replaced with clean (and less prominent) white and black text. The information listed in the Evaluation Panel has also been updated. 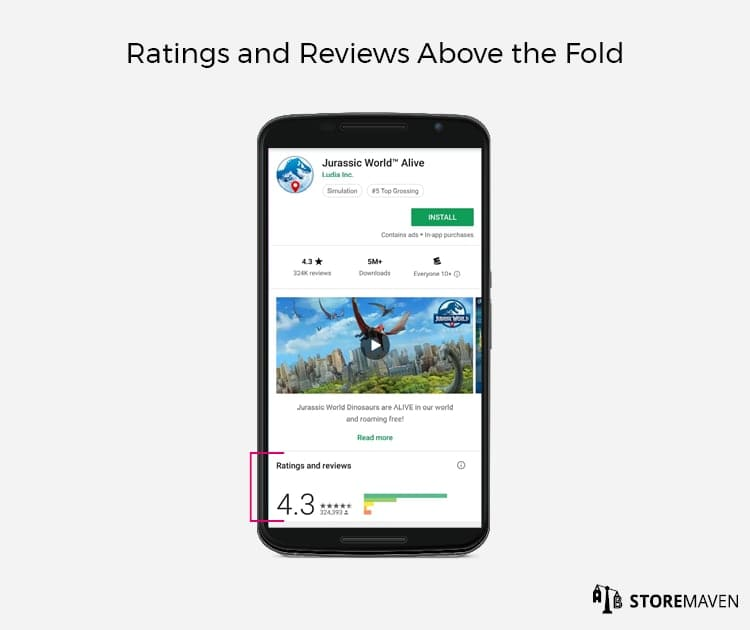 Instead of highlighting the Number of Downloads first, Google showcase Average Star Rating with the number of reviews underneath, the Number of Downloads, and then the Age Rating, which has now been given more prominence than in the previous Google Play design. In the old Google Play layout, the Gallery was pushed mostly below the fold. However, now that the Feature Graphic is no longer at the top of the page, the Gallery has become the most important visual component and is fully visible in the First Impression Frame. This naturally encourages more visitor engagement by showing visitors that there is a Gallery full of images to explore. In fact, based on our initial tests, there is a 30-50% higher explore rate in the new layout. With this increase in engagement also comes an increase in Gallery scroll of 3-6 times the original Gallery Scroll rate. Additionally, the Video also plays more of a significant role in the new layout, with visitors being 60% more likely to watch it. For developers who haven’t yet optimized their Video, they could see a major hit to CVR. Our data on the previous layout and on iOS show that people who watch the Video are typically more likely to scroll through the Gallery. However, an insight we uncovered is that the presence of a Video actually decreases the Gallery Scroll rate by 51% in the new design, which is interesting to monitor further. The implications of this are that your Video becomes even more important, and the downside of a negative Video is potentially bigger. Overall, the Gallery is one of the most impactful changes in the new layout. Most developers previously neglected the assets in their Gallery since they didn’t impact the bottom line as much as the Feature Graphic did. However, now that both Decisive and Exploring Visitors will be exposed to the Gallery Video or Screenshots, those assets must be given proper attention and optimized accordingly so you avoid losing valuable installs. Since Google allow developers to upload Screenshots in a range of sizes, the way in which they are subsequently displayed in the Gallery varies. In some cases, you can see two full Screenshots, and in other cases you can see almost four full Screenshots. As mentioned previously, if you had a Video with a Feature Graphic in the old layout, it is now placed as the first asset in the Gallery. In general, landscape assets take up the full width of the Gallery section, but you can still see part of the next asset to encourage visitors to continue scrolling. In a Hybrid Gallery, the Video is displayed first, and the remaining Portrait Screenshots are condensed in order to match the height of the Video. This is important to keep in mind if you include captions or small details that may not be as visible when condensed in the Hybrid Gallery. The Short Description is much less prominent than it used to be. It no longer appears below the Evaluation Panel and is instead placed after the Gallery. In some cases, it can appear below the fold either partially or entirely. However, since it is placed directly below the Gallery, which is now being given more attention, we’ve found that there is an 18% higher expand description rate. Although the description may not be given as much importance as in the old layout, it’s important to know that many Visitors still expand the description to learn more about your app or game. The text they read there should be written not only from a keyword mindset but from an optimization standpoint as well. Google are testing a new section called “Editors’ choice” that comes before Reviews and Ratings. 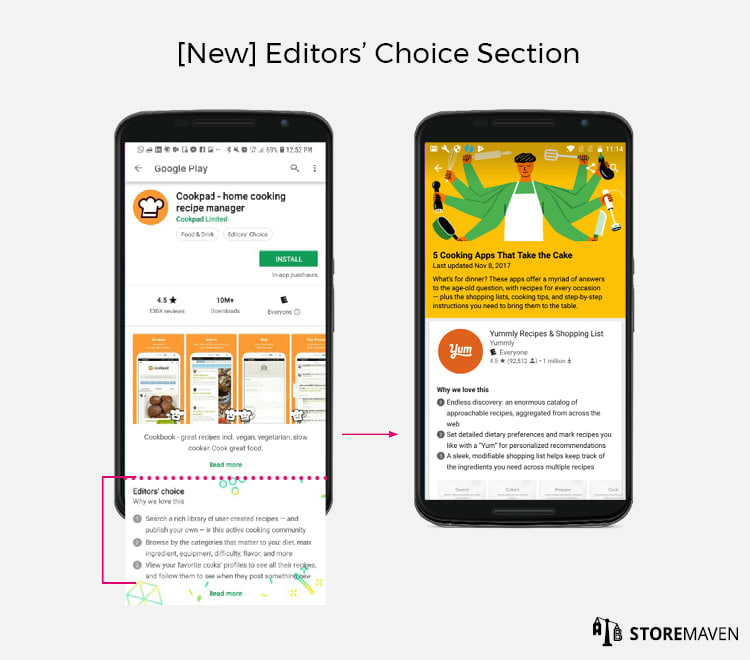 It lists out the top three reasons the Google Play Editors love this specific app, and the “Read more” button brings you to a new page with an aggregated list of the editors’ favorite apps in that same category. This creates another exit/drop point from your Store Listing that didn’t exist before, which may have a negative impact on CVR. If visitors click the “Read more” button, they could become distracted by the new page and even find an alternative app to install that’s in your same category. Not every app will have this section, and although it’s still being tested, it should be monitored closely. *This new section is not currently present on all devices, so it appears that Google are still testing it. The Ratings and Reviews section remains the same as the old layout. 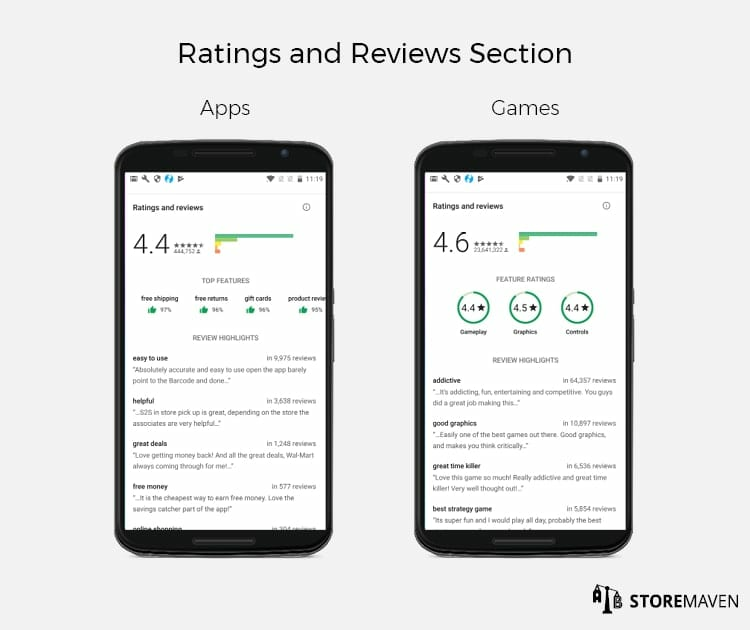 The only update is that there’s now a section title–“Ratings and reviews”– and there’s a small information icon that takes you to the “Comment posting policy” on the Google Play support website. Although this section wasn’t updated, we found that visitors are twice as likely to scroll through reviews in the new design than they were in the previous layout. This is most likely due to the overall increase in exploration, which means your ratings and reviews may have a bigger impact on visitors’ decision to install. It’s also important to note that in most cases, the Ratings and Reviews section is pushed just below the fold. However, depending on the Android device size and Screenshot size/orientation, there are instances in which it can appear within the First Impression Frame. This could potentially drive installs if ratings are high and reviews are positive. 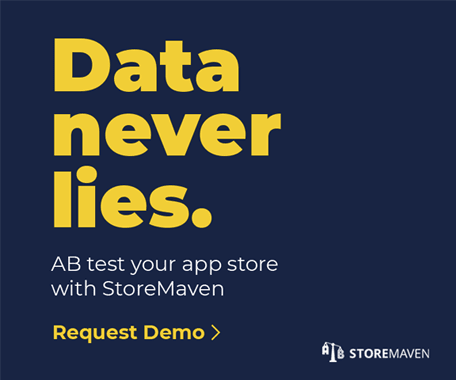 Alternatively, you may want to monitor your app’s performance if there are poor overall ratings and negative reviews being shown in the First Impression. Within the footer, you will still see personalized app recommendations and widgets for similar apps. 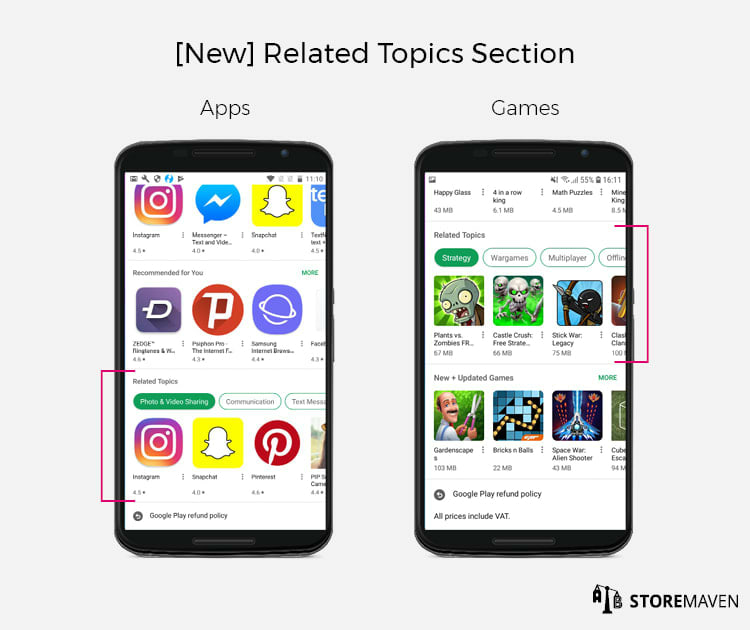 However, there is a new section called “Related Topics” that shows a list of apps or games related to specific keywords. This shows that Google continuously tries to improve its personalization and recommendation engine. However, as we revealed in our post on the limitations of the new Google Play Console organic insights, it’s unlikely that you’ll be able to derive meaningful insights based on this new flow. *We noticed that some Android devices don’t yet have this new section, which means Google are still testing the widgets and recommendations they showcase in the Footer. As you can see, there are a significant amount of updates being made to Google Play Store Listings. Most developers haven’t prepared for this redesign and have neglected to optimize and update their Gallery. And we don’t blame them. 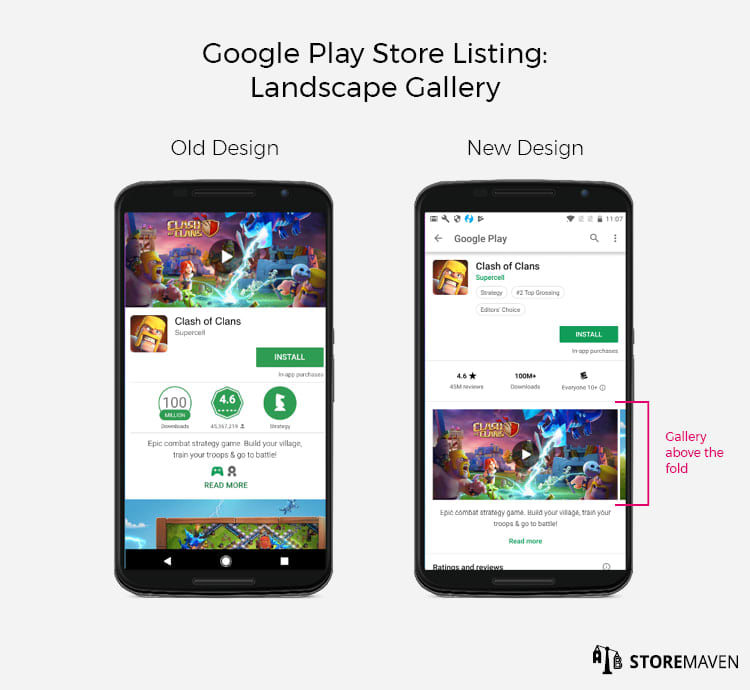 In the previous Google Play layout, the Gallery had a much lower impact on performance when compared to the iOS Gallery, so it wasn’t a top optimization priority. What this means now, though, is that a majority of developers will potentially lose valuable installs and see a hit to performance now that the redesign is being rolled out. In our tests, the new layout caused a CVR decrease of about 15% because the assets, specifically the Gallery, weren’t optimized appropriately. With the new, more prominent focus on the Gallery, there is now tremendous impact tied to the size of the Screenshots that you upload. As we mentioned previously, Google allow you to upload Screenshots between a minimum and maximum resolution, which impacts how many Screenshots are visible in the First Impression. You can play around showcasing between around 2 (more similar to iOS) and 4 images. 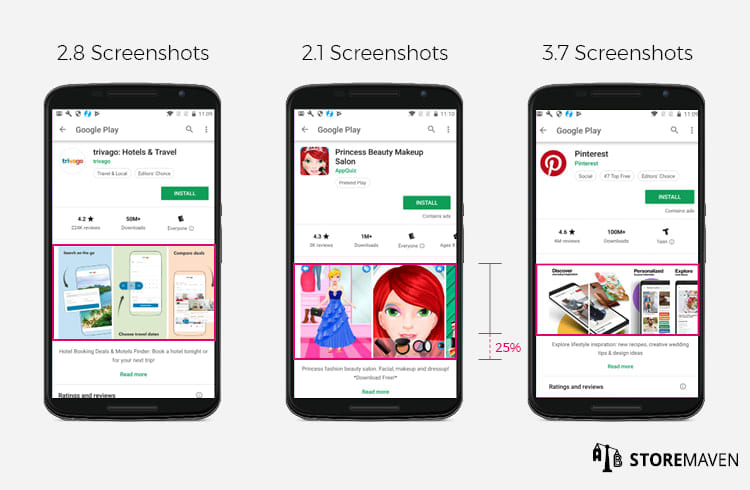 Unlike on iOS, where Screenshots have set sizes, Google Play adds another dimension to keep in mind when optimizing your Store Listing. In general, you need to find the sweet spot between design, messaging, and size. Depending on the dimensions you choose, you can squeeze more vertical Screenshots into the First Impression Frame, but, in turn, sacrifice the amount of space each one is given, and vice versa. As you can see in the example above, Pinterest has almost 4 full Screenshots in the First Impression Frame, but the Screenshots are slightly condensed and the Gallery is subsequently given less real estate on the page. Finding that sweet spot for your app or game specifically can only be done by running smart tests. For developers, the new layout has presented the challenge of optimizing assets that are now visible to 100% of Store Listing visitors. Additionally, there’s the challenge of optimizing assets that previously weren’t impactful. The Video Watch Rate of the old Google Play design was around 6% (sometimes less), so developers didn’t give priority to optimizing their Video. 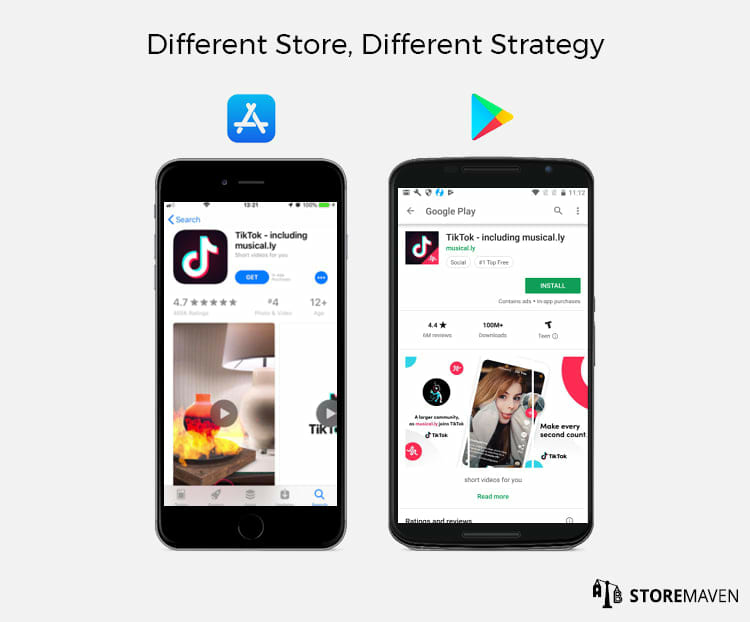 With the new layout, as we touched on above, there is a much higher chance that the Video will receive attention, thus making it an extremely important component of effective ASO testing strategies. What are the main messages I should communicate in the new First Impression? How do I leverage the messaging that worked for me in the Feature Graphic to have the same effect in the Gallery? What is the optimal size of Screenshots I should use? Should I include a Video? How should I design the Poster Frame for that Video? 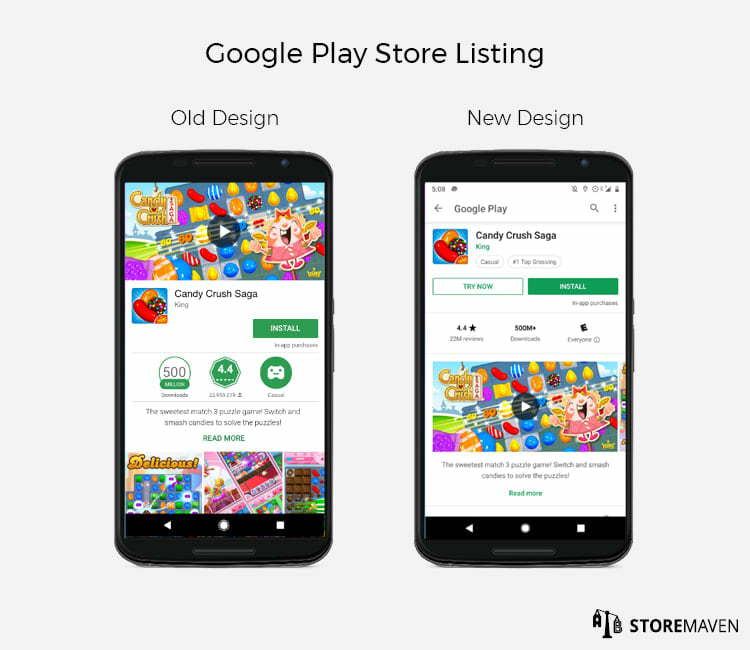 Although the Google Play Store Listings now more closely resemble the iOS App Store Product Pages, you should not assume they will have the same results. The user base for Google is not the same as iOS—user mindsets and preferences are fundamentally different. So, if everything is different, why would you market your app in the same way? Short answer: you shouldn’t. Google Experiments is a tool you can use to start A/B testing your Store Listing in the new layout. However, this is not an effective tool on its own if you want to analyze the full impact the redesign will have on your overall visitor behavior, CVR, and performance. While you can test different variations, the only results you receive at the end are which variation led to the most installs but not why. To effectively optimize your Store Listing, specifically the Gallery, you’ll need to take unique visitor behavior patterns into account. Without understanding how people engage with the various assets on your page, you’re unable to identify the positive or negative impact different changes had on your CVR, and you will lack insights that are used to form the foundation and hypotheses of subsequent tests. For example, our tests reveal not only what percentage of your visitors watch the Video, but whether these Video watchers actually converted into installs. By isolating which exact seconds of the Video encouraged installs or drops, you can identify your most impactful (or harmful) messages and can continuously improving the Video in each test that follows. Overall, you need this data to effectively answer the questions we posed in the previous section, but it’s not something you’ll get from Google Experiments. 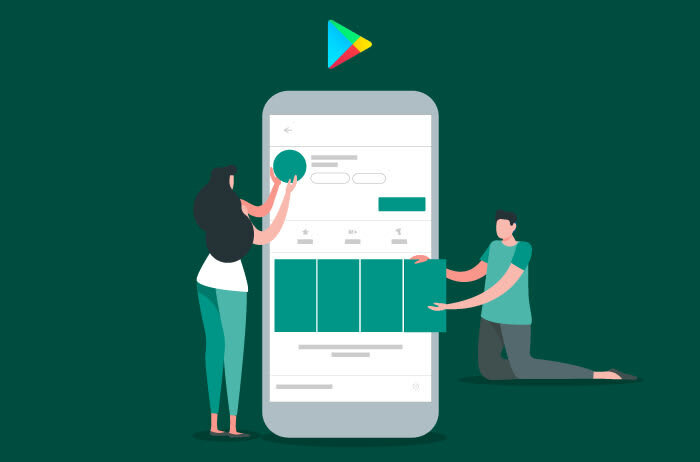 The new layout of the Google Play Store brings a colloquial saying to mind–when the tides are low, you can see who’s swimming without a bathing suit. In that same vein, Google have just lowered the tide and exposed the least optimized area of your Store Listings to 100% of the world. In other words, don’t get caught without a swimsuit, and start testing your assets in the new Google Play design today. Jordan Bennett is a Marketing Manager at StoreMaven. She earned a BA from the University of Southern California, and has worked in marketing at companies in San Francisco, London, and Tel Aviv. In her spare time, she loves reading fiction books, finding the best vegan food, and traveling around the world.